I love scarves! This single accessory can totally transform an outfit, add warmth on a cold morning, and highlight the versatility of stitches and patterns available to crocheters. And with the stunning variety of scarf designs and styles available, I may need another dresser just for my scarves. I am especially fond of lace scarves. Beautiful swaths of lace showcase the exquisiteness of crochet stitches. Lace also works up quickly and is an economical use of that luxury skein of yarn. A great lace scarf option is motifs. In her new book, Kristin Omdahl explores new methods of joining motifs as you go that are even more economical. I love the delicate motifs of the Snowflake Scarf, and I would love to work the delicate blossoms of the Blissful Flowers Shawl as a scarf. 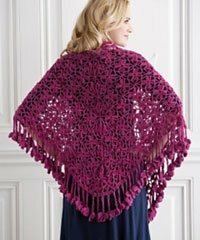 Seamless Crochet is full of beautiful motif-based projects, each of which could easily be worked as a scarf or shawl. Try them in striking colors to brighten your winter outfits and add some fun to your spring wardrobe. Scarves are wonderfully warm (whether crocheted in a lace pattern or bulky stitch), and this is an advantage I am especially thankful for in the middle of winter and in early spring. A swath of crocheted draped around your neck provides an ideal way to help your body conserve its heat. Bulky scarves such as the Rapunzel Scarf, worked in superwash merino, work up quickly and pair beautifully with a jacket or sweater. I have been known to wear a scarf around the house on a chilly evening. With yarn in a brilliant blue, a cheery red, or your color of choice, worked in a bulky textured stitch or a delicate lace, a scarf is the perfect eye-catching accessory. For the perfect lace motif scarf, order Kristin Omdahl's Seamless Crochet today and whip up a closet full of beautiful lace scarves to accent your wardrobe.